When SpaceX boss Elon Musk’s new rocket hurled his red Tesla car towards Mars on February 6, space entrepreneurs and enthusiasts exulted around the world. They cheered as much for the car and its dummy driver Starman as for the Falcon Heavy super rocket that did the job. The privately-funded Falcon Heavy (FH) is now the most powerful working booster on Earth and can lift 64 tonnes of cargo to near-Earth orbits, claims SpaceX (Space Exploration). FH, with its reusable rocket stages, dwarfs the power of NASA’s Delta IV Heavy by half at a third of its cost. Where does India stand in rocketry? 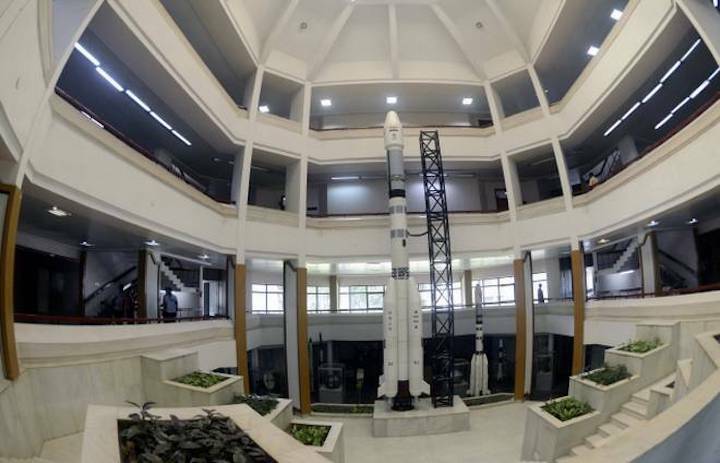 The 58-year-old Indian Space Research Organisation is currently perfecting a rocket that can lift four tonnes to higher orbits and about eight tonne loads to lower orbits, the GSLV Mark III (or just MkIII). ISRO Chairman K. Sivan congratulated SpaceX on its “very great, wonderful, and innovative feat”. ISRO, too, has envisioned developing super-heavy launchers that can one day lift loads as heavy as 50 to 60 tonnes. The technology is complex. Many supporting technologies leading to it, such as the semi-cryogenic fuel-based propulsion and reusable systems, are being explored under ongoing research, he told The Hindu recently. “A [super] heavy lift vehicle of the future is on the drawing board as part of our R&D. We are doing a lot of preliminary research leading to it. Right now, we are developing a semi-cryogenic engine, which was approved some time back. Next, we must propose [for funding approval] a full semi-cryogenic stage. A lot of work is ahead of us, in this,” Dr. Sivan said. There is no clear time frame or cost estimate for it, but if approved, it would be a single, innovative, two-stage vehicle, which would cater to all demands, he said. SpaceX’s FH, first heard about in 2005, is reported to have cost $ 500 million. Such a heavy duty vehicle should be developed future-ready should the government green-flag a human space flight proposal, or it would cater to other large payloads in the coming years. A human space launch would have a roomy, safe, and habitable capsule for astronauts. The present plan is to try out the semi-cryo stage at the core of MkIII in place of its liquid fuel engine, without changing the design. This would raise its muscle power 50% — from four to six tonnes. Gradually it would be enhanced to 10 tonnes and eventually 50 to 60 tonnes, by developing a modular super vehicle with many additions or strap-ons built around the main structure. FH used a similar tactic, according to Dr. Sivan, who oversaw preliminary semi-cryo related works while he was ISRO’s propulsion head until recently. “At the same time, ISRO is developing reusable technologies. The re-entry component was demonstrated in 2016. Landing experiments, return from orbit and stage recovery will have to be demonstrated as part of our R&D,” Dr. Sivan said.